I am a freelance software engineer, specialising in iOS and Mac development. Introducing DynamicXray, a UIKit Dynamics runtime visualisation and introspection library for iOS. If you have done any work with UIKit Dynamics you may have found that it can be difficult to debug and fine tune the behaviour. UIKit Dynamics is driven by a rigid body physics engine (Box2D in fact) which gives the developer a lot of power, but the abstract nature of the framework can make it difficult to see under the hood of the physics simulation. DynamicXray provides a live overlay of all dynamic behaviours and dynamic items at runtime, allowing you to visualise and introspect the underlying physics simulation as it is running. DynamicXray works on both devices and simulators. DynamicXray is free and open source. Download the DynamicXray framework and learn more at http://dynamicxray.net/. Download the source code from https://github.com/chrismiles/DynamicXray. Recently I worked with the awesomely smart team at Bjango to help them build a new Mac tool. Here it is, Skala Color. 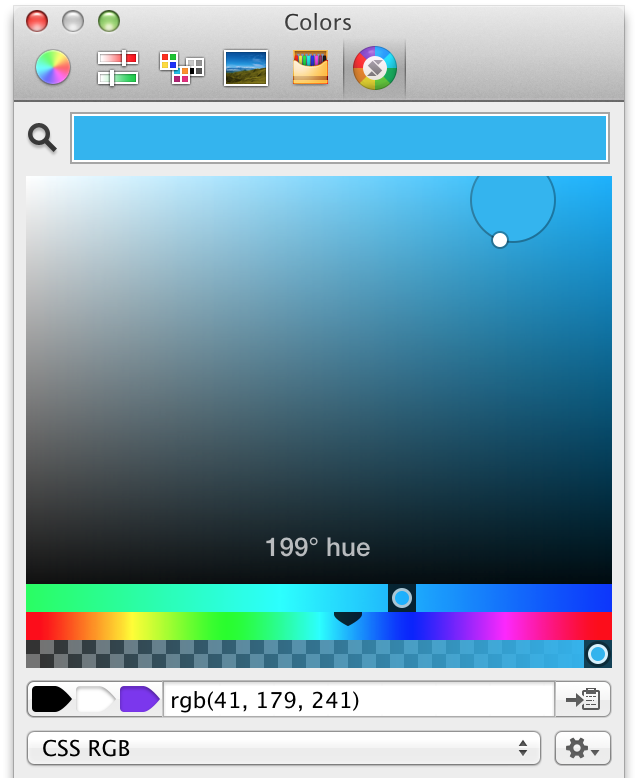 Skala Color is a Mac OS X colour picker plugin. When installed, it sits right beside the built-in colour pickers that everyone is used to like the colour wheel and the crayon selector. What stands Skala Color apart is its attention to detail. Skala Color was built for the modern Mac OS X environment, with Retina display crispness and carefully crafted animations for a smooth experience. At the last Swipe Conference I presented two talks on OpenGL ES for iOS developers. I have now published these presentation videos for anyone to watch. I hope they might be useful resources for the iOS community. One of my favourite iOS apps is Pocket Weather Australia by Shifty Jelly who are a friendly little development team based in Adelaide. 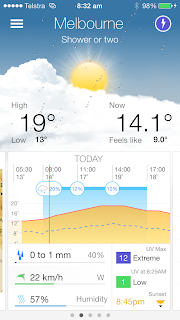 So it was an honour when they approached me to lend them a hand with development of their new version, overhauled and optimised for iOS 7: Pocket Weather 4. Specifically, my scope was to build a new, modern graphing engine for them, to replace the old legacy graphing code they had been using for years. 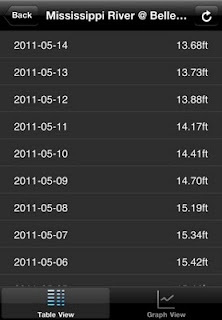 There are a few iOS graphing libraries around that produce good results, both commercial and open source. However, third party library dependencies are always a trade off between convenience and managing extra baggage. Plus the ability and/or cost to customise them to meet requirements varies quite a bit. Based on the requirements, my preference was to hand-roll a graph rendering engine using native Core Graphics and Core Animation frameworks, rather than bring in a third party graphing library. Announcing EasyRes, a Mac OS X fast screen resolution switcher with live animated previews. My friends at Itty Bitty Apps have released an awesome new tool for iOS developers. 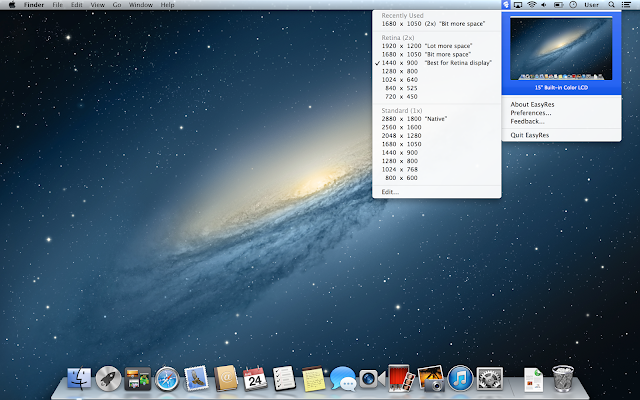 Reveal is a Mac OS X application for introspecting iOS apps at runtime. I have been helping the Itty Bitty Apps team develop Reveal for the past 6 months or so. 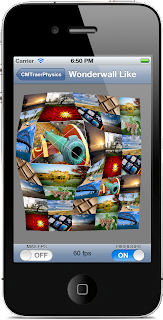 My focus has been on the 3D view hierarchy explosion visualisation, using Scene Kit & OpenGL. 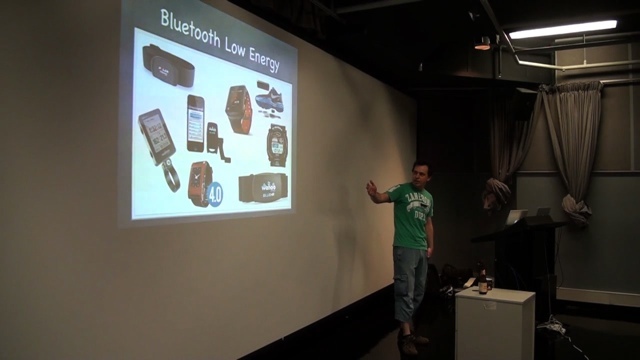 At February's Melbourne Cocoaheads I gave a presentation about integrating Bluetooth LE peripherals with iOS devices using Apple's Core Bluetooth framework. 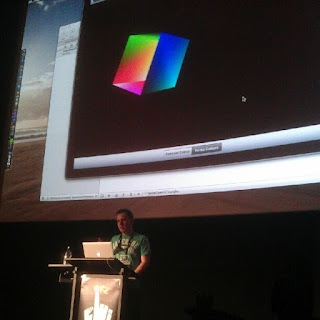 In September I presented two talks at Swipe Conference in Sydney. The second talk, "OpenGL ES with iOS 5 Part 2: Rendering a masterpiece", covered rendering effects in OpenGL using GLKit, looked at the OpenGL debugging and profiling tools that ship with Xcode, and demonstrated how OpenGL can be used for some fancy segue transitions.. 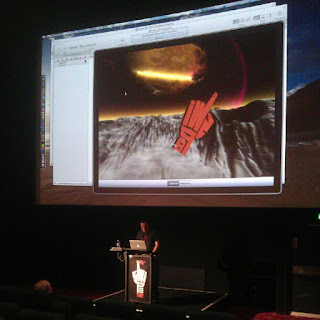 In September I presented two talks at Swipe Conference in Sydney. The first talk, "OpenGL ES with iOS 5 Part 1: Learning to draw", was an introduction to OpenGL ES and GLKit, aimed at iOS developers new to OpenGL programming. 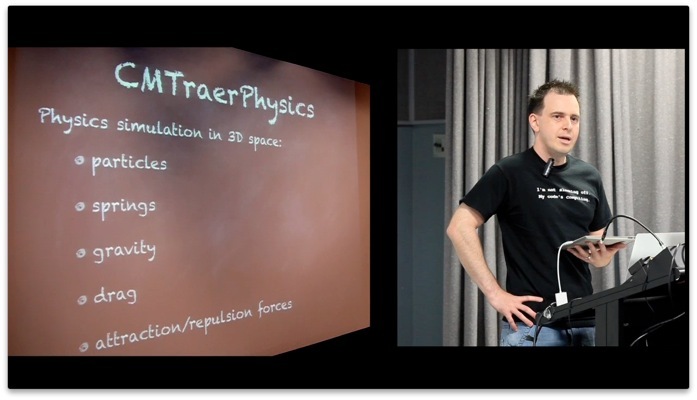 In March I gave a presentation at Melbourne CocoaHeads about my open source project CMTraerPhysics. 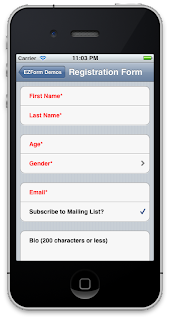 Announcing EZForm 1.0, my open source form handling and validation library for iOS. 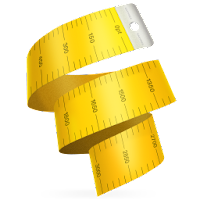 New blog post: Announcing CMTraerPhysics - my port of the Traer v3.0 spring physics engine to Objective-C/Cocoa. 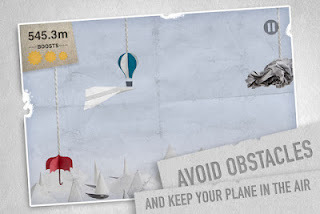 Source includes an app containing interesting physics demos. 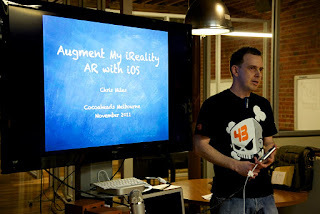 New blog post: My Cocoaheads talk on Augmented Reality with iOS - at November's Melbourne Cocoaheads meeting I gave a talk about Augmented Reality with iOS where I review and demonstrate the current set of AR libraries, both commercial and open source. Video embedded below. New blog post: Working With a Famous Blue Hedgehog - I describe a cool project I got to work on late last year, an augmented reality app incorporating a famous video game character. New blog post: Cocoaheads Talk: Developing an iPad in-store interactive product browser - earlier in the year I gave a talk at Melbourne Cocoaheads detailing some of the technical challenges that went into making this in-store product browser iPad app. Video embedded below. New blog post: Core Data debugging with SQLite - describing how I access the Core Data SQLite store directly for debugging and testing during iOS development. 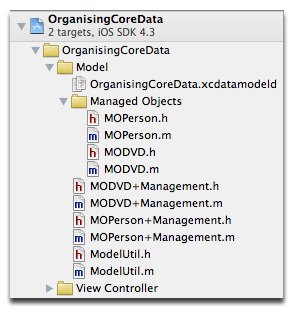 New blog post: Organising Core Data for iOS - I describe the pattern I have settled on for organising Core Data code in an iOS app. Complete with full source for a demo app showing how I use Core Data in a "real-world" iPhone app. New blog post: Locayta Notes 2.1 - I describe some the enhancements to one of my client projects, an iPhone/iPad notes/text editor containing full text search & Dropbox sync. Available free in the App Store. 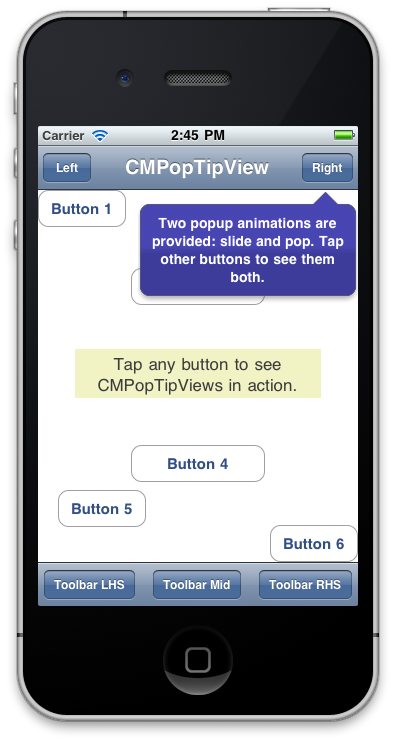 New blog post: CMPopTipView - new animation option - an update to my custom iOS callout view class. New blog post: River Level 1.1 - an update to one of my hobby iPhone projects, available in the App Store. 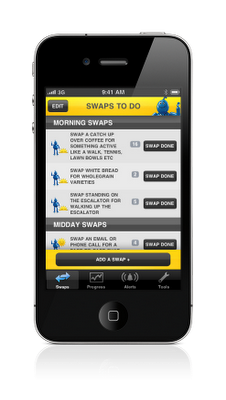 New blog post: Swap It Don't Stop It iPhone app - one my latest client projects, available in the Australian App Store. New blog post: git sharing with dropbox. New blog post: Locayta Search Mobile for iOS beta5. Explains a new feature in the latest beta of Locayta's full text search library for iPads & iPhones. New blog post: Locayta Notes 2.0. Announcing the release of Locayta Notes 2.0, a project I've been working on for Locayta Limited, available free in the App Store. New tech blog post: git push dropbox. I posted about a custom iOS view I have released on github: CMPopTipView. Read the post about CMPopTipView. New tech blog post: iPad External Screen Mirroring. I've been busy at Locayta lately preparing some Locayta Search Mobile demo apps. We have released the first of these, Locayta Notes, a free iPad/iPhone note taking app. Even better, we've released the source code too! 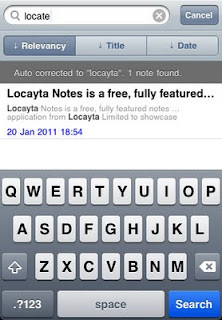 I've written about the Locayta Notes release here and you can get Locayta Notes from the App Store.